As Russian troops are massed on the eastern border of Ukraine, it’s a tense situation. The reports from Crimea are grim. If there was ever a time to pray for the nation and the region, now is that time. As my thoughts and prayers are with the people there, I want tohonor their faith throughout the rapidly unfolding events of recent months since the EuroMaidan protests began. I also want to inform people of the spiritual side of the revolution in Ukraine, which I have followed in amazement. God is doing a great work, which, I believe, will continue to grow in the region. Fed up with corruption, Ukrainian society is searching for new moral authorities and reference points. And none are more open than the young generation. Every day during the protests pastors, priests and lay Christians have been present among the people on Independence Square, known as Maidan, leading prayer and worship from the stage, speaking with people who are grappling with the situation, serving food, and caring for the wounded. Many of our Ukrainian friends have been among them, even at risk of their lives. Evangelical, Orthodox and Catholic churches set up prayer tents and provided accommodation and refuge at monasteries and churches. In an effort to prevent violence, as riot police were about to storm the camp, priests and pastors stood between the police and the protesters. 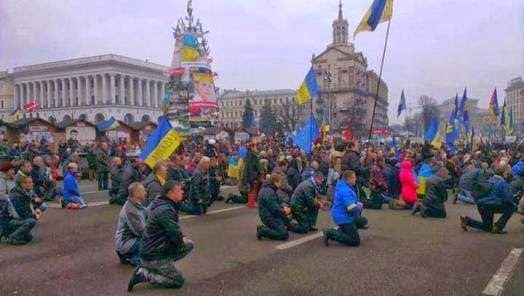 Prayer is essential and our Every Nation churches in Ukraine have asked for fervent, ongoing prayer. Our churches, which are all led by Ukrainian pastors, have been gathering, sometimes daily, with other churches in their cities to pray. The battle for freedom and justice is a battle against corruption, but it remains, in reality, a spiritual battle. 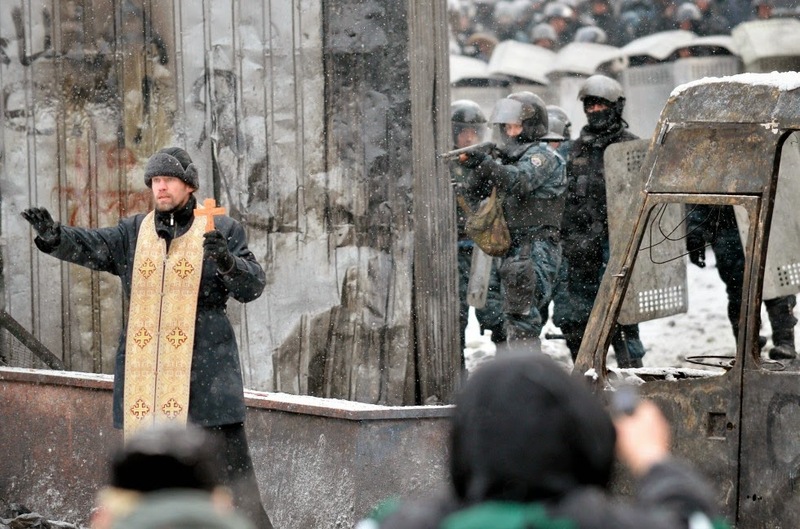 Along with prayer, Ukrainian heroes of the faith preached the Gospel openly on the streets as violence escalated. After the first casualties in February, priests and pastors made an effort to tell every man who went to the front lines about Christ and how to be reconciled with God. St. Michael’s Ukrainian Orthodox Cathedral and Monastery offered refuge to protestors in the early morning hours one Saturday in November after police dispersed the crowd with batons and stun grenades when protests on Kiev’s Independence Square swelled to nearly 10,000 people. Running up the hill away from the square, young protesters knocked on the gold-domed monastery’s gate and were offered refuge. “This is the only safe place we have left, and besides I have nowhere else to go,” said Alexander, a seventeen-year-old student from Lviv. St. Michael’s was destroyed during the religious purges of Soviet dictator Josef Stalin and rebuilt after Ukraine’s independence. As the violence escalated in early December, some of the injured were carried or driven to the monastery grounds to be treated by doctors since patients risked arrest if taken to state-run hospitals. With dried blood on his leather jacket, one young man said police knocked him unconscious and he managed to crawl away from the square. People took him to the monastery in a taxi so he would be safe. Community formed at St. Michael’s as people brought food and clothing. Some attended an early morning service at the cathedral on the monastery grounds after which several black-robed monks listened to the protesters and urged them not to seek revenge. “They gave us tea to warm us up, told us to keep our spirits strong and told us not to fight evil with evil,” said Roman, a native of Kiev. “I don’t go to church much, only to escape from the powers of evil,” he said. I was moved by Mykhailo Gavryluk’s powerful example of mercy and forgiveness. He was severely tortured by police, then forced to stand naked in freezing temperatures surrounded by onlookers. A video of his assault went viral. When called to court recently to face one of his torturers, he asked the judge to pardon the guilty man. The protesters demand justice and truth, which come from God. This presents an opportunity for the church to preach a standard that can only be reached by Christ and can only be offered by His grace. Justice and truth are central to the Gospel. As the ground shifts and Lenin statues topple, revolution can lead to reform, repentance and faith, and produce lasting change in the country and the region.